Industrial had established a working relationship with Micronutrient Initiative in mid-2013, on a project to build their Micronutrient Forum website. 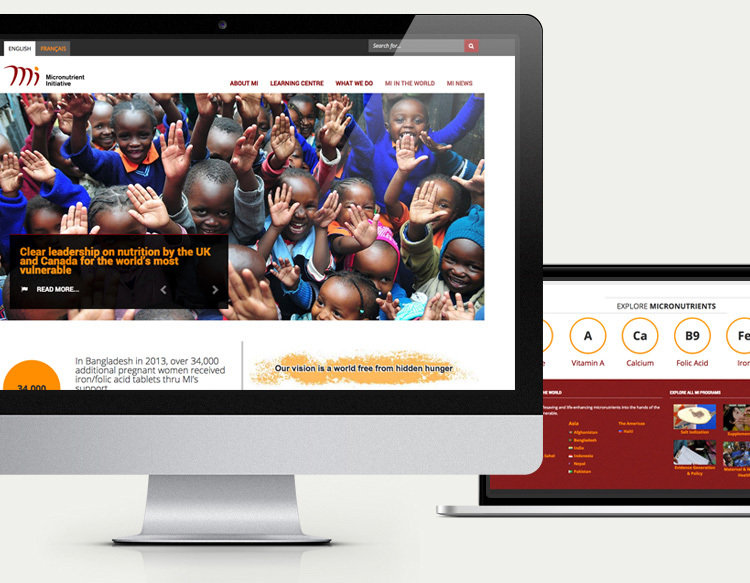 In 2014, Micronutrient Initiative contacted Industrial about a new project, to finish the development of their new website, which was currently in progress and incomplete. The website had been started by a previous contractor, however there had been issues in quality and speed of development, which caused Micronutrient to seek out an alternative vendor to take over the implementation. 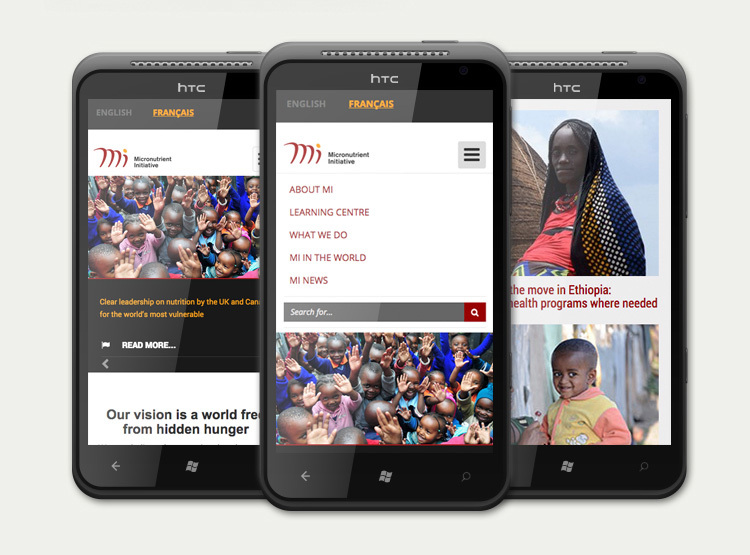 The goals of the website were to produce a responsive website with a modern look and feel, and to provide easier and more direct access to find out information and news about the Micronutrient Initiative. WordPress was chosen as the Content Management System for the application, to provide an easy to use interface for content generation. As Industrial was entering into this project during the middle of development, they needed to use a different approach than their standard process. The first critical step was to do an analysis of the code and get a "lay of the land" from a development perspective. Issues were immediately noticed in the plugins being used to power some of the core functionality. A multisite plugin was being used to handle a bilingual website, as opposed to more traditional translation modules. As a result, many steps needed to be duplicated during the development effort. The next step was to review the designs that had been previously approached, and identify what work remained to get the feature set to match the anticipated results. This provided some challenges, as features were encountered that appeared to be working, but were not matching the specific requirements that Micronutrient Initiative had intended. To ensure that a more complete understanding of feature requirements were understood, Industrial and Micronutrient made use of frequent calls and meetings for clarification and documentation. With the functionality development completed, Industrial was able to launch the website in 2015. After receiving a final sign off from Micronutrient Initiative, the deployment process began. There were challenges in deployment, as the server that hosted the existing website, was not compatible with the platform chosen to build the website. 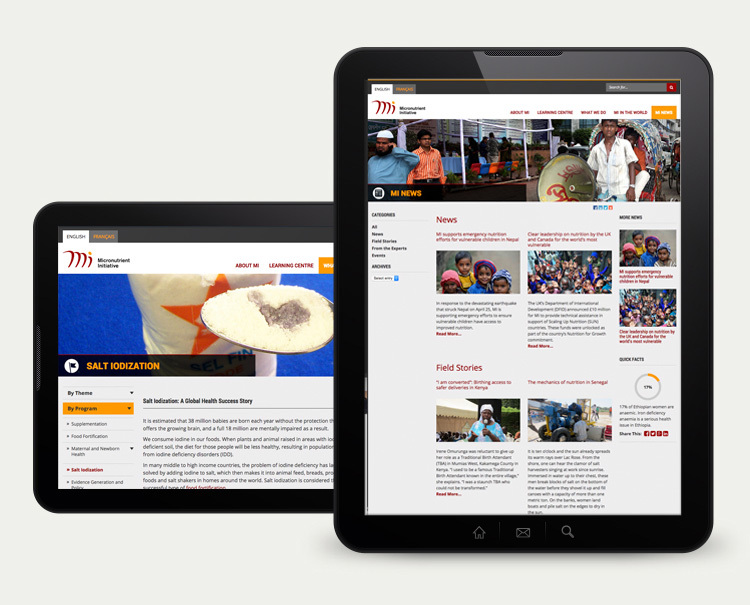 Industrial quickly worked with the hosting provider for Micronutrient Initiative’s websites to ensure that a new server could quickly be ready, and configure the sever afterwards. In the end, the website was successfully launched. Industrial set up a number of redirects to ensure that key traffic pages were still able to be found, and continued support was provided to Micronutrient Initiative. The website achieved its goals of providing a more modern and responsive experience for the end users, while being easy and convenient for Micronutrient Initiative to publish content. Micronutrient Initiative works deliver essential nutrition programs to those who need them and increase education about essential nutrients.